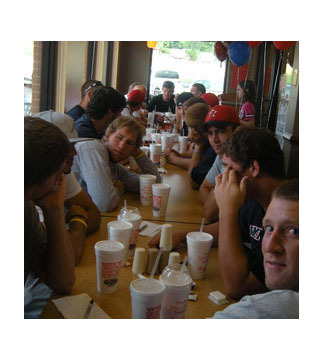 Wednesday was Lunch with the Generals Day at the newest, busiest restaurant in town, Chick-fil-A. Fans showed up to get their baseballs signed and to take pictures with the Waynesboro Generals. First-year player Jon Clinard of Austin Peay was among the Generals out for the event. Clinard has been with the team all season. Jarryd Summers, a pitcher from West Virginia University, has been with the team for about two and a half weeks. “I was planning to take the summer off, but then I got a call from the coach and decided to come on down and play,” said Summers, who is 1-1 with a 3.00 ERA in three appearances, including two starts, for Waynesboro this summer. Summers was not the only new team member out at the Chick-fil-A today. Catcher Haskell Fink has been with the team for about three weeks now. “I decided to come after I got the call because I knew it was a good league,” said Fink, another Austin Peay product who is hitting .250 in six games played this summer. Bethany Shelton, head of PR at the local Chick-fil-A, was there to see how it all unfolded. 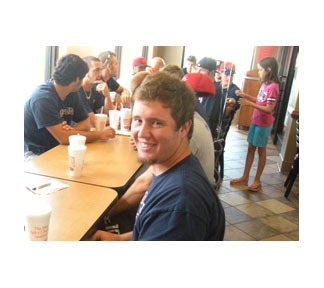 “We saw Harrisonburg Chick-fil-A do it with their team the Turks, and we saw how fun it was. The boys just really enjoyed it, and it brought a good crowd, so we thought we would do the same,” Shelton said. Shelton would like to make the Lunch with the Generals Day into an annual event. “It’s a good way to advertise for not only us, but them also. Like today they have a game, so meeting the fans this afternoon is a good way to let them know about the game this evening,” Shelton said.